This is the perfect class for anyone who knows nothing about Word, or has used Word for a little while, but needs to learn how to do more. We will take you from knowing nothing to writing an actual business letter in about an hour. First, we show you how to start Microsoft Word, and go over the different parts of the screen: the title bar, the tool bars, the menu bar, the document area, and so on. Then, we'll teach you how to customize Word to make it a little easier to use. The default options for Word can be a little odd, so we'll show you how to change the Zoom Ratio to make the text easier to read. We'll make sure you're in the correct print layout view, turn the task pane off, and fix your toolbars so they're easy to work with. Next, we'll start writing a business letter for a fictional company. We'll discuss entering text, editing text, spell-check-on-the-fly, clippy, moving the cursor (the insertion point) to edit text, backspace v. delete keys, moving around with the arrow keys, and more. We'll also talk about the on-the-fly grammar checker. We'll teach you how to split a large paragraph into two. We'll teach you about non-printable characters, and how to view them on the screen. We'll show you how to insert horizontal lines in your documents, and discuss some of the AutoComplete options. In lesson six we'll go over all of the different ways to format your document. We'll show you how to highlight (select) text, change the font type, font size, bold, italics, underline, justification, color, and so on. We'll also teach you how to create bulleted and numbered lists. We'll even teach you about mail and web hyperlinks. Next we'll show you how to edit your letter like a pro using cut, copy, and paste. We'll also show you how to move words and paragraphs around without having to use cut and paste. We'll also teach you about one of the best features ever to have been added to a program: undo. We'll cover saving your document to your hard drive. We'll show you several ways to load your document back off the disk. We'll also teach you how to save multiple copies of your document so that you can save different versions. We'll show you how to print your document and go over several different printing options. We'll teach you all about the power of Print Preview and how you can shrink your document down with just one click to get rid of those annoying "short" last pages. 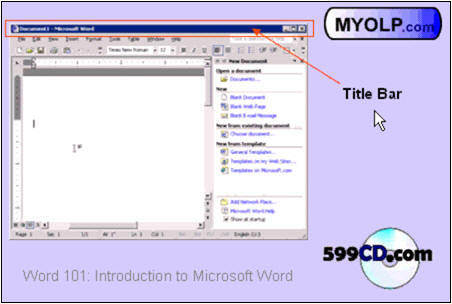 Again, this is the perfect all-around program to teach someone the basic, fundamental features of Word. It is perfect for new computer users, people new to word processing, secretaries who need to learn basic letter writing and editing, and anyone who wants to sharpen their Word skills. Richard Rost on 10/12/2007: Cut, copy, and paste are probably the most important features you will learn in ANY Windows application. I use them constantly. Richard Rost on 1/17/2008: The END key is one of the keys on your keyboard, near Home, Insert, and Delete. Look for it. You should find it. I wish to try an advanced topic, but need a special type font. Is it possible to create a unique type font that could be used in different Office Apps? I have never seen this topic discussed anywhere. Richard Rost on 2/2/2008: Yes, you can - but you'll generally need third party software to do it. You can't just easily create your own font with the tools that Windows and Office give you. If you run a Google search on "create font" you'll find lots of articles and software on creating fonts. I haven't made my own fonts in YEARS (since the early 90s) so I really don't know what the best app for this is now. Richard Rost on 3/13/2008: Pat, honestly I have not spent a whole lot of time with Word 2007 yet. I'm still working with XP and 2003 myself. Personally in this situation I use AutoCorrect. For example, I'll make an AutoCorrect entry for "RDR" which are my initials and will insert my complete name and title at the bottom of my letters. Richard Rost on 3/13/2008: If you want to start a few lines down from the top, that's the TOP margin, not the LEFT margin. You can adjust all of your margins by going to File > Page Setup. Donald Davison on 3/17/2008: I can't keep the cursor on my document area when i follow your lesson. When I snap on and off, the cursor on my document area does not stay. Also, I have to keep moving your lesson in order to see what I am doing on my document area. Can this be fixed? Richard Rost on 3/19/2008: I recorded my videos in small windows so you should be able to see them side-by-side with Word or whatever program you're using. If you click on the EXTERNAL checkbox in my player, then each video will load up directly in Windows Media Player which you CAN resize and move around the screen. As far as the "cursor" problem you're mentioning, I'm not sure I understand what you mean. Tiziano Volpi on 5/27/2008: suppose a word is underlined with the red squibble and I add it to the dictionary (the red underline disappears; if I made a mistake is there some means to take the word away from the dictionary? Richard Rost on 6/13/2008: Tiziano, good question. In Word 2003, go to Tools > Options > Spelling & Grammar. Click on the "Custom Dictionaries" button. You'll see a list of dictionary files. Click on CUSTOM.DIC and click on Modify. You'll be able to remove words there. In older versions of Word, you may have to go to Windows and actually FIND the CUSTOM.DIC file, but it's just a text file so you can open it in Word and edit it manually. Richard Rost on 8/3/2009: Dyonne, you probably have Microsoft Word 2007. Yes, the toolbars are completely different. I'm finishing up my Word 2007 beginner tutorials now. That's what you need. michelle on 7/23/2013: I was watching WINDOWS 101---- formating aspect of the course. you showed how to USE DASH to underline an address of a business letter by pressing : dash, dash, dash, dash and PRESS enter. I tried it on my WORD 2010. Somehow, I lost that feature by mistakenly CLICKING on " do not show this again ". I need this feature back on my WORD 2010.What do I do? Do you mean WORD 101? In any case, I don't have Word 2010 installed anymore, but the feature still works in Word 2013, however it creates a solid line across the entire page. You can press UNDO to revert back to a line of dashes if you want. I prefer to use the UNDERSCORE character for creating things like signature blanks. Anonymous on 11/11/2015: I would like to know if you have anything on word 2016 that is where I am working right now. I am aware of this viersion. the newer version is what I need now. The Word Course List is here. They are 2007 which is where the Ribbon was introduced so there won't be too many differences.